Invite colorful birds to your yard with this graceful garden bird bath. 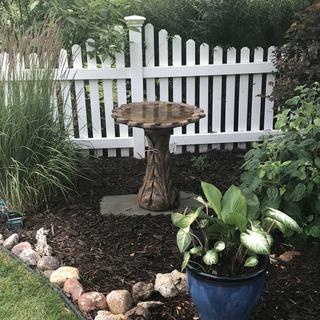 This bird bath features sturdy cast stone construction. Presented in a wonderful relic lava finish, this piece will provide years of outdoor decoration. A graceful column and bowl add beauty, along with two crafted birds who perch on the rim. Henri Studio was started more than 40 years ago when Tuscan sculptor Eneri Prosperi came to the U.S.A. He combined master hand-sculpting techniques with cast stone, a highly dense material with a texture similar to limestone. Made from a special cement blend of coarse and fine minerals, pigments, and water, it is enriched by exclusive finishes that convey vivid natural stone highlights in subtle organic tones. Please note this hand-crafted, custom made-to-order design ships for free, but may require freight curbside delivery due to its size and weight. 31" high x 25 1/2" wide. Weighs 102 lbs. Garden bird bath. Hand-made in the USA by Henri Studio. Relic lava finish. Cast stone construction. Due to its natural materials, variations in color and texture will occur. 2 piece bird bath. Some assembly required. Because I was looking for a real, heavy stone, tall bird bath...and this is perfect!!!!! Thank you! How long dose this take to receive ? BEST ANSWER: Once you add this to your cart, you will see delivery options. Must the "Henri Studio Tapered Petal Cast Stone 31" High Bird Bath" be brought indoors during Northeastern US winters? BEST ANSWER: Hi - Basically, do not allow water to collect and freeze in the bird bath and it is preferred to move it indoors. 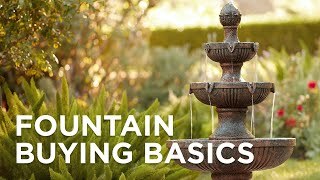 But, I have added a helpful link below with several tips for winterizing fountains as well as bird baths. From what I've read in instructions, yes. It slopes down to about 2 inches at the center. It's really well-made, I love it! It took a while to get it, but it was well worth the wait. Well-made and a beautiful addition to the yard. Loved the bird bath. It took a little while to come in but turned out beautiful. It's not near as red as i was expecting. It's still very attractive, actually I like it better in person then even the picture. Very pleased with my purchase. Birdbath with substance and style. Lovely! I love the s birdbath! It’s substantial and pretty. It’s heavy enough to be difficult to lift, although it is in two parts. But that’s exactly what I wanted, something that wouldn’t blow over. I would definitely recommend it. The bird bath is beautiful and very well constructed. Long wait to arrive about 5 weeks but completley worth it! 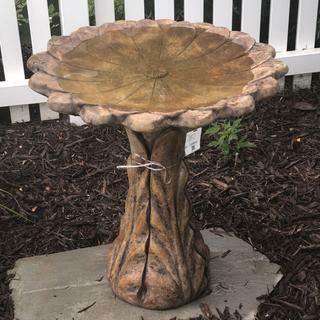 It is a stunning Birdbath that is not something I’d be able to find in a garden center near me and I am in absolute love with this.. Follow your instincts to care for our winged creatures and install this white moss outdoor bird bath in a garden or yard space. 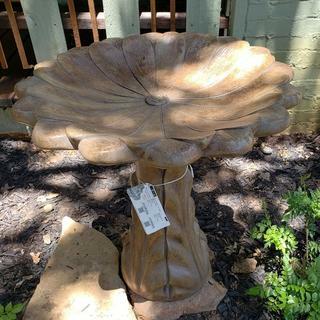 Simple elegance and a warm finish offer a tasteful accent for a garden or patio area in this outdoor bird bath. Angelic themes offer positivity and a graceful touchand this white moss outdoor bird bath is no exception.